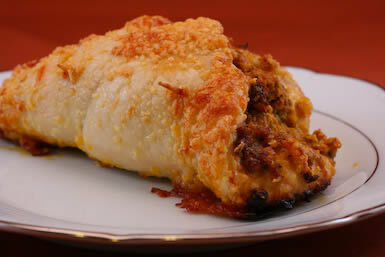 Yesterday I posted a really great recipe for Baked Chicken Stuffed with Sun-Dried Tomato Pesto, Basil, and Goat Cheese. I loved the way this recipe turned out, and if you like the sound of those ingredients I hope you’ll try it. I actually made that chicken nearly two weeks ago when a friend at school brought me the jar of the sun-dried tomato pesto I showed in the step-by-step instructions. That jar of pesto was the one that inspired me to try making my own Sun-Dried Tomato Pesto, something I still can’t stop eating. In the post yesterday, I explained how I realized it would be easier to spread the filling on the chicken if I buzzed the pesto, basil and goat cheese a few times in the food processor. When I did that last night to test it, I had to take another photo for the step-by-step instructions. Well of course, I had to cook that chicken breast didn’t I? Here’s the thing. Six days ago I started back on phase one of the South Beach Diet. I’d definitely been cheating a little on South Beach and needed to regroup. Not that I had gained a lot of weight, only a few pounds. But in the month of October I’m going to be doing some traveling, and when I travel I like to eat anything I want. I decided a little phase one “insurance” was in order to prepare me for fitting into my skinny jeans for the trips. I hadn’t done phase one for quite a while, and I’d forgotten how great it is. I know everyone has different body chemistry, but for me, within six days my stomach is noticably flatter, I have more energy, and I’ve lost 4 1/2 pounds. The front of the South Beach Diet Book says “lose belly fat first” and I swear to you, it’s absolutely true. This is why I love the South Beach Diet. It’s so easy to maintain your weight by going on phase one for a week or two whenever you need a diet tune-up. Anyway, that’s a very long introduction to say that this is the Phase One version of yesterday’s recipe that I promised. I’m going to print the entire recipe here for people who might find it while searching for South Beach recipes, but I suggest you look at yesterday’s post for Baked Chicken with Sun-dried Tomato Pesto, Basil and Goat Cheese to see the step-by-step instructions. I did think this turned out to be just as tasty as the original version, so if you’re on phase one, I don’t think you’ll feel deprived. And when I was chatting online today with my favorite Gluten-Free Goddess, I realized that with the changes I made, it’s also a gluten-free recipe. Preheat oven to 350 F. Trim all visible fat and tendons from chicken breasts. Put chicken breasts, one at a time, inside a heavy plastic plastic freezer bag and pound with meat mallet or other heavy object until 1/4 inch thick. Put pesto, goat cheese, and chopped basil in food processor and buzz a few times until mixture is combined but not completely blended. Spread 1/6 of pesto/basil/goat cheese mixture on each chicken breast. Roll up chicken, starting with smallest end, tucking in loose pieces and securing with two toothpicks. Spray glass casserole dish with nonstick spray and arrange chicken so pieces are not touching. Bake 350 F 40-50 minutes, or until chicken is slightly browned and firm, but not hard to the touch. I recommend you start checking it after 40 minutes, and remove from oven as soon as the chicken feels firm and is slightly browned. Serve hot. Caution: I did notice that the cheese that fell off the chicken burned in the bottom of the pan before the chicken was done, so you might want to be aware of that and remove it if you see some cheese starting to burn. For a great Phase one meal for the South Beach Diet, serve this chicken with Arugula and Gorgonzola Salad with Balsamic Vinegar (one of my favorite salads for any phase!) or Cucumber Salad with Balsamic Dressing, and Cauliflower with Garlic and Lemon. We didn't have toothpicks, so instead of rolling up the chicken we layered it like a casserole.Two chicken breasts on the bottom, chese mix in the middle, and the two chicken breasts on top. It was a lot less time-consuming, and tasted just as good. I absolutely love that idea, thanks for sharing! I tried this dish last night. I am trying Phase 1, but having a great deal of difficulty so your blog is a lifesaver in navigating the first few weeks. I started making this a little too late in the day, so instead of flattening the breasts, I made a pocket and put the stuffing in there. I also didn't have any fresh basil at this time of year, so I used cilantro that I had in the fridge. I browned the breasts in a cast iron skillet to set the cheese and then placed them in the oven at 350. They were so delicious. Thanks for the recipe. It's a keeper. Melissa, glad you liked it! Mar, that is fantastic! Thanks so much for the nice feedback. I'm definitely planning to keep up the blog for a long time to come! Just wanted to say thanks for your help with this diet. My wife wanted to try the south beach thing so I reluctantly agreed to go along with it to be supportive. I started on January 2nd at 250 lbs and here we are on April 2nd and I am down to 208 lbs!! My biggest worry was boredom with the same old salad and eggs every day but your web site was real answer to that problem. I have made a lot of our meals with your recipes and we have both enjoyed them all. Thanks again and please keep this up. Tory, thanks for the wonderful feedback. I love your idea of adding some chopped spinach to the mix and also the idea of combining cream cheese and feta for a milder cheese mixture. Thanks for sharing! this was the first SBD recipe i even tried, and remains my favorite! i made some modifications each time i cooked it, and now have standard "my version" of the recipe. i substitute a few tablespoons of low-fat cream cheese and about a 1/4 cup of reduced fat feta instead of the goat cheese- it's much cheaper and i like the taste even better! i also finely chop baby spinach and add about 3/4 of a cup into the cheese mixture, as i don't love tons of basil. 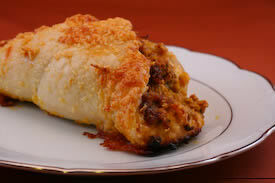 i also made this recipe into an appetizer once for a family dinner party- everyone loved it! thanks for all the inspiration! i've yet to have a kalyn recipe that i didn't love. I'm trying this out tonight and it will be the fourth recipe I've tried off your blog…Your making my stage one so much better than the first time around! KD, good luck to you. I promise you can eat a lot of good food on this diet, and IT WORKS!! Hang in there. This is my very first post in your blog and my first try at a south beach recipe and it is really worth it.i hope i can be brave enough to try more. I didnt really want to go on a sb diet but my mom convinced me since im so huge already. Good thing i found your site. Youre really giving me hope that i can last and enjoy the sbdiet. Made this tonight – Delish! Even my very picky husband loved it! Thanks for helping me get through Phase 1! Thanks guys for letting me know you liked it. I appreciate the nice feedback! I made this for my family tonight and got a HUGE thumbs up from spouse, Very Picky Daughter, and my mother. Thank you!!!!!!!! Kalyn, I am new to the south beach diet and this is the first recipe I have tried. It turned out great! My husband even loved it. I brought left-overs to work one day for lunch and all my co-workers wanted the recipe. Brussels sprouts are fine. The only vegetables not approved for phase one are high sugar/ high starch veggies like carrots, sweet potatoes, winter squash, etc. I can’t think of any green vegetables that aren’t okay! This recipe with with Sun-Dried Tomato Pesto, Basil, and Goat Cheese” looks GREAT. Anonymous, so glad you liked it. Pretty funny too (great minds thinking alike and all that stuff) because I have a similar recipe posted for chicken stuffed with green chiles and cheese! Great recipey! 🙂 My family doesn’t like sun dried tomatoes, so I substituted whole canned green chilis and just rolled them up. The family loved it. My daughters said that I can make it when Dad and I are done with the diet! Your site is a great encouragement! Thanks! This recipe is absolutely delicious! It smells wonderful, too. My husband asked me to make it again soon. Thank you, Kalyn, for this fantastic recipe. Naudee and Michelle, thanks so much for letting me know that you tried it and liked it. Amazing! Rich, flavorful, filling… I also used your recipe for homemade pesto. Very Delicious! just letting ya know I tried this and it is wonderful. it smells good as its cooking and its not only a tasty dish but an attractive one too. thanks so much for posting it! Mae, thanks. It was really good. Karina, no basil!! That’s just sad. I hope they have it at TJ’s. I wish we had Trader Joe’s here! We had to postpone trying the recipe because we couldn’t find any fresh basil to make pesto. [Ack!] We’re making a trip down to Trader Joe’s this week; will score some basil there. I really love the look of this Kalyn. I can imagine it being so tasty. Greg, I can ask him, but I don’t think my brother has ever had cholesterol issues. I know he lost weight easily and had the esame experience I did with the shrinking waistline. Here’s my own numbers. Both of these were when I was not on medication (which I took for 7 years.) The first set of numbers was when I convinced my doctor to let me go off medication just to see how bad my cholesterol was; the second one was after about a year on South Beach. The other three measures were good in the second test but not valid in the first, probably because I was off the charts. I will be working on the phase one recipe category as soon as I can, but not for a couple of weeks at the earliest. I think your Phase One recipes would be a huge help- perhaps a daily menu too? GOOD JOB on those 4.5 lbs! that is terrific! the recipe sounds amazing too…i make something very similar, but im pretty sure my version isnt SB friendly…maybe Ill tweak it to be more like yours! Emily, I would LOVE to come there and cook it for you. Just send a plane ticket!! Maria, I haven’t tried this pesto on fish, but I think it would be good on swordfish, halibut or mahi mahi. I like regular basil pesto on fish too. Karina, fun! Let me know how it turns out. Hi Kalyn! I told Steve about your recipe and his eyes lit up. Guess what we’re making this weekend? Now I just need you here to prepare it…then maybe I could actually make it through phase one again!! Sounds like this recipe is a definite keeper. Hi Kalyn–hope this comment goes through, my server was cranky yesterday and I couldn’t leave a comment about your yummy dish yesterday. This time of the year is my danger period–so many parties and holidays to contend with. 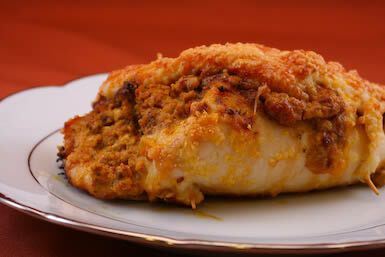 The stuffed chicken–delicious! What a lovely way to lose some pounds. Oh this one looks good too!!!! Very pretty when its cooked. Great post! Kalyn, this looks really delicious. And a little crispy cheese on the bottom of the pan doesn’t sound like that much of a bad thing! Thanks for sharing this recipe.